Deep Carpet & Rug Cleaning Services Abbey Hey M18 | Quality Property Care Ltd. Using a professional carpet and rug cleaning company, and using its services frequently is a very good strategy, especially if you or someone in your family suffers from pollen or dust allergies or has respiratory problems. The quantities of dirt, dust, dust mites and germs in our carpets and rugs are actually quite alarming, so don’t hesitate to hire Quality Property Care Ltd., which offers a high quality rug and carpet cleaning service in Abbey Hey M18 and the area. The rug and carpet cleaning company can also offer: curtain cleaning, drapery cleaning, blinds cleaning, as well as bed bug mattress treatment and mattress cleaning , which will help remove the allergens, dust mites and kill off all bacterias. The firm offers commercial and residential carpet and rug cleaning at a competitive price. The company Quality Property Care Ltd. was established in Abbey Hey M18 back in 2005, and since then has been growing and evolving, to manage to catch up with all the latest trends in the cleaning sector. The cleaners are all vetted, regularly trained and supervised for their cleaning performance. The machines, instruments and solutions used for the deep carpet cleaning, and the other cleaning services provided are certified, safe and modern . The cleaners can handle any kind of spills on your rugs or carpets, including: wine, oily stains, blood, oily stains, wine, rust, vomit, coffee, paint or tea. All services delivered are insured, and the quality is guaranteed. 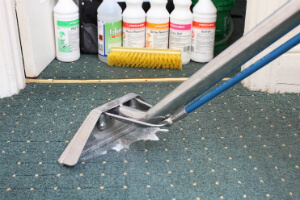 The most effective deep cleaning for rugs and carpets is the wet deep carpet cleaning or the hot water extraction carpet cleaning from Quality Property Care Ltd.. It involves pre-treatment of the rug by hoovering with specialized vacuum cleaners, and then carpet spot and stain removal, followed by the steam carpet cleaning. The trained cleaners perform a top quality shampoo carpet cleaning, using certified and safe cleaning solutions, which will not cause harm to you, your kids or your house animals. The carpet or rug will have as much of the water taken out from it, so it will need only 2 hours to completely dry off. If you request it, the cleaners can perform a very nice deodorising of your carpets and rugs for an added clean and fresh effect. There are some rugs and carpets that can't safely be cleaned with water, so the cleaners will provide a very efficient and safe dry foam carpet cleaning. The special and perfectly safe foam is sprayed and rubbed into the rug or carpet, and after it has done its cleaning work, it is extracted with the suitable tools and vacuum cleaners. The same can be done with your curtains, mattresses or blinds and draperies. Dry carpet cleaning demands no drying time, so you can step on your carpet or rug just after the cleaners are done. If you are in Abbey Hey M18 or the region and you need professional commercial or residential rug and carpet cleaning, bed bug mattress treatment, mattress cleaning,, curtain cleaning, blinds cleaning, drapery cleaning, or a combination of 2 or more of these services, all you need to do is call the client care service at this number 0161 823 0325 or complete and send the online booking form, and you will get written verification via e-mail and sms as soon as possible! Same day booking is possible, as well as booking on bank holidays and weekends without any price raise. Book your professional rug and carpet cleaning service today!